Don't freak out when you read the next line. As all-ages venue Empyrean closes its doors to move across town to the Big Dipper next week, Caterina Winery will do the same. Sort of. The winery was recently purchased by another local vintner, Townshend Cellars, with plans to close Caterina for renovations after this Saturday. When it reopens in early 2010, says Patrick Kendrick, there will still be live shows at Caterina — just not the same number that Spokane is used to hearing there. Kendrick, the brains behind Platform Booking and the wine bar manager there, says the closure will only cause a slight hiccup for live music at the venue. But Kendrick isn’t upset by the change. He’s happy with renovation plans — which will re-up the facility’s capacity to nearly 100. While that venue is getting a facelift, Kendrick will sink his booking skills into revamping another local venue that’s “been there the whole time”: Sunset Junction. It’s the kind of place you’ve driven past a million times — just across the street from the Browne’s Addition Rosauers, nearly in the backyard of the Swamp Tavern. Inside Sunset Junction last Friday night, the bar’s a ghost town. A hard rock band plays to a nearly empty room. The cocktail waitress leans on the bar, absent-mindedly watching the band. A scattered few patrons play pool and step outside to smoke. The bartender warms up near the fireplace. Kendrick recently met with management at Sunset Junction to talk about re-branding the bar and putting Platform Booking at the helm for its live music offerings. It’s a huge space, ripe to be utilized as a major venue. “They are looking to be a part of supporting the local music scene more than they have been. And Platform Booking will be putting on some of the shows,” Kendrick says. With a capacity of 194 and a brand-new sprinkler system, the 21-and-older venue could be the latest — and largest — pet project for Kendrick. 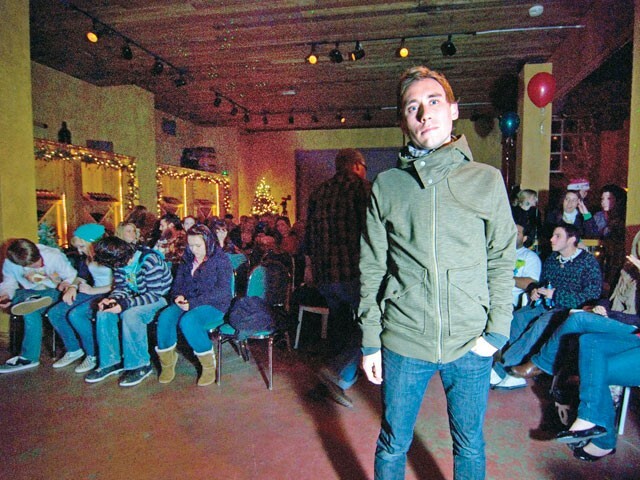 The now 30-year-old native first turned heads in 2005 when he packed Rock Coffee (in the current Knitting Factory building) night after night with local and touring bands. When Bravo Entertainment muscled out Rock Coffee in 2006, Kendrick had 88 shows planned that needed a home. Now with Caterina shifting its focus, Sunset Junction expressed an interest in having Kendrick help bring in a younger clientele. Kendrick is working with the Crosbys to schedule bands at Sunset Junction starting in January. Right now, he’s looking to host weekly “Whammy Wednesday” open-DJ nights and Thursday night “fan feedback” events. Kendrick already has a handful of shows booked for Sunset Junction in early 2010. He says that no matter where he books — there, Caterina, Mootsy’s — he’ll keep supporting the local music scene. Caterina Remodel Kickoff Show No. 1 with Oil of Angels, Space Station Revival, Hallelujah Soul Explosion, Henry Nordstrom and Vaughn Wood on Friday, Dec. 18, at 8 pm. Tickets: $5. All-ages. Caterina Remodel Kickoff Show No. 2 with Belt of Vapor, Beluga, Fjords and Seafloor Spreading on Saturday, Dec. 19, at 8 pm. Tickets: $5. All ages. Call: 328-5069.